Carthusian (also known as Carthusian-Andalusian, and Carthujano) horses originated in Spain. They were created when the Zamora brothers purchased a stallion by the name of El Soldado and bred him to two mares. A colt and a filly were produced, and the colt (a dark gray) was named Esclavo and went on to become the foundation sire of the Carthusian breed. Esclavo went on to produce many offspring, which were sold to breeders in Jerez, Spain. One group of mares sired by Esclavo around 1736 were sold to Don Pedro Picado, who then gave part of them to a group of Carthusian monks in the settlement of a debt and sold the rest to Antonio Abad Romero where they were absorbed into the main Andalusian breed. The stock given to the monks were bred into a special line, known as Zamoranos, and specific breeding of the Carthusian horse was established by the 1400s. Throughout the following centuries, the Zamoranos bloodlines were guarded by the Carthusian monks, to the point of defying royal orders to introduce outside blood from the Neapolitan horse and central European breeds. They did, however, introduce Arabian and Barb blood to improve the strain. By the 1700s and 1800s the Carthusian strain was beginning to become well established. The Carthusian monks sold a large number of horses to Don Pedro and Juan Jose Zapata, which were subsequently purchased in 1854 by Don Vincent Romero y Garcia, a Jerez landholder. Through his breeding expertise, Don Vincent improved the breed quality without introducing outside blood. Today, the Carthusian strain is raised in state-owned studs around Jerez de la Frontera, Badajoz, and Cordoba. The stallion Esclavo is said to have had warts under his tail, and his characteristics were passed on to his offspring. Some breeders felt that without the warts, a horse could not be of the Esclavo blood line. Another characteristic sometimes seen in the Carthusian is the evidence of "horns," actually frontal bosses thought to be inherited from Asian ancestors. The descriptions of the "horns" vary from calcium-like deposits on the temple to small horns behind or near the ear. Unlike the warts beneath the tail, the horns were not considered proof of Esclavo descent. They are used for riding and are 15.2 hh. 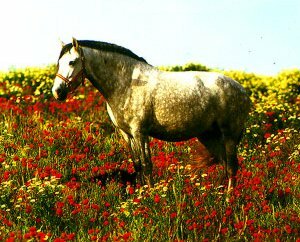 Carthusian horses are not a separate breed from the Andalusians, but are a distinct side branch of that breed and usually considered the purest strain remaining. They are one of Spain's most prestigious lines and have one of the oldest stud books in the world. Their predominant color is gray. Some Carthusians are chestnut or black. Their head is light and elegant with a slightly convex profile, broad forehead, small ears, and large, lively eyes. Their neck is well proportioned and arched; their chest is broad and deep; their shoulders slop; their back short and broad; their croup is sloped; and the legs are sturdy with broad, clean joints. Nearly all members of this breed have good conformation.